When I was young and moaning about having to wear boring regulation school shoes, my Dad told me to consider myself lucky, as when he was a child in 1920s London some of his classmates had no shoes at all, attending school in bare feet. This seemed unbelievable to me, but, sadly, was true: leather shoes and boots were expensive and often difficult for large families to afford, especially in the days before the welfare state. Historically, appearing in public without shoes or stockings demonstrated extreme poverty: a person’s clothes might be worn or patched, but going bare-legged and barefoot was considered degrading. Yet until at least the 1930s, this was not uncommon in poor urban and rural communities, young children often going barefoot in the streets or fields. To address the ongoing footwear problem in manufacturing districts of the midlands and north, sturdy wooden-soled leather clogs were often worn - cheaper and longer-lasting than conventional boots. Housewives everywhere would sometimes go without new shoes so that their menfolk and older children could be prioritised and appear decent for work and school. Lack of footwear, important for a respectable image, was humiliating - a clear sign of reduced circumstances. For generations school pupils were aware of their classmates’ individual situations from the condition of their boots or shoes - or their absence. In the typical household, providing well-fitting footwear for growing children has always been a concern. Before mass-production, all cities, towns, villages and even small hamlets boasted professional shoemakers and bootmakers who made and repaired footwear for the local population, although bespoke made-to-measure boots or shoes were mainly restricted to privileged children from affluent families. Charles Darwin’s granddaughter, Gwen Ravarat, recalled in her memoirs how, as children in late-1880s/1890s Cambridge, she and her siblings had high leather boots made by the local shoemaker, ‘who ran a tickly pencil round our toes…We never had ready-made boots.’ However, in many ordinary working families new boots were more likely bought ‘off the shelf’ whenever finances allowed, sometimes without the prospective wearers even being present. A man receiving his week’s wages after work on a Saturday might visit a late-opening shop or warehouse and return home as the family patriarch and bread-winner, proudly bearing new children’s boots. As mechanised manufacturing advanced in Britain, some footwear began to be mass-produced from the 1870s, with Clark’s (established 1825) a pioneer in the field. Tiny Victorian and Edwardian children were sometimes dressed in dainty shoes strapped with a narrow bar high across the instep, but school-age children typically wore substantial leather ankle boots: in the 1800s these were usually buttoned using a button hook, while laced boots became more common in the early-1900s, especially for boys. During the 1910s low-cut shoes began to replace traditional boots for men, women and children, reflecting the gradual modernisation of dress. However, some children continued to wear old-fashioned boots after the First World War, the same footwear being repaired and then handed down from child to child in large families. 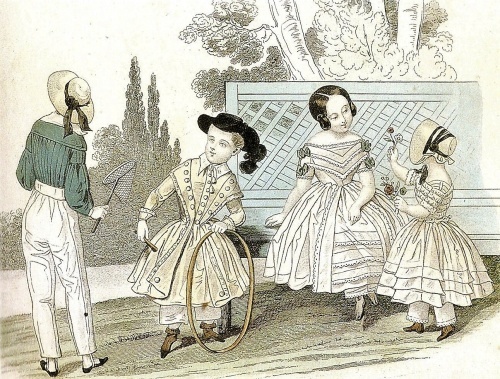 Conversely, in comfortably-placed households where new shoes were acquired regularly, there were recognised gradations in the style of footwear according to the age of the son or daughter, with small children wearing picturesque juvenile modes and ‘teenagers’ adopting more adult forms of shoe or boot. As school uniform developed and became established in the early 20th century, soft rubber-soled canvas sneakers or plimsolls were adopted for PE and children often wore these cheap comfortable shoes for play after school, on weekends and for holidays. In disadvantaged families these were sometimes worn throughout the day, instead of expensive leather boots or shoes. During the 1920s as suntans became fashionable and going bare-legged without stockings or socks grew socially acceptable, sandals with a T-bar became popular for children. The basic T-bar shoe or sandal remained a familiar style throughout the 20th century. Between the wars it became more widely recognised that comfortable, well-made footwear was important for children’s healthy development and that ‘bad feet’ were the consequence of ill-fitting shoes. During the Second World War, when material resources were in short supply and dress items strictly rationed, mothers were especially fearful that their fast-growing children would develop foot deformities. Some government help in the form of extra coupons was given to families with young children rapidly outgrowing their clothes and shoes, while older women sometimes passed some of their coupons to young families. The WVS (Women’s Voluntary Service) also provided practical assistance, opening clothing exchanges at which decent children’s clothes and shoes could be exchanged for larger sizes, without spending money or precious ration coupons. An early measuring system, New York inventor Charles Brannock’s measuring device, was patented in the 1920s: this measured the length, width and arch length of the human foot and formed an important prototype for many future models. Meanwhile Clarks had earlier appointed as a director an American, John Walter Bostock, experienced in superior US factory processes. Bostock devised a new shoe fitting system based on the detailed analysis of thousands of foot measurements taken from local school children. Reflecting the findings of the survey, the company launched its new children’s ranges in 1945 with a choice of four width fittings, at the same time as the new Clarks foot gauge that acted as a scientific measuring instrument to aid the shop assistant fitting children’s shoes. Start-rite (established 1792) also rose to prominence around this time for its quality children’s shoes, the company’s iconic twins’ advertising posters being displayed on the London Underground between the 1940s and 1960s. In 1955 Start-rite was granted a royal warrant by HRH Queen Elizabeth II to supply footwear for the young Princes Charles, Andrew and Edward and Princess Anne. A second royal warrant was granted in 1989 by HRH the Prince of Wales to supply children’s footwear for Princes William and Harry, but this was withdrawn in 2003 when the company’s production moved abroad. Visits to Brighton’s key shoe shops are an annual family ritual at the start of the new school year. Parents will be concerned with the relevant school’s style specifications and the fit of the shoes, children themselves mainly interested in what looks cool. Once in the classroom they may not notice whether friends are wearing second-hand or ill-fitting footwear, but they will all have shoes. Best foot forward….